If your website is not actively helping you reach your studio goals for the year, it’s time to invest some effort in improving it. If that sounds a little overwhelming, don’t worry; we’re about to break it down into 5 simple, achievable steps. Think back to how your website felt when you pictured it a minute ago. Is it clean and clear? Is it warm and inviting? Does it feel cluttered and impersonal? How does your website make parents feel? Are they greeted by lengthy blocks of text that they don’t have time to read? Do they see an impersonal image of piano keys? Good news: it’s easy to update your homepage and keep a parent engaged in what you have to say. → First, start with a large photo of students who are having a great time playing music in your studio. Put it front and center on your homepage. → Second, choose one or two colors that compliment your photos and use those colors in small amounts throughout your homepage and the rest of your website. Bonus tip: Don’t be afraid of white space; it creates a clean, restful feeling. → Third, come up with a few words that capture your studio’s unique quality. Highlight your studio name and those words near the top of your homepage. They should be the first thing a parent reads on your website, and it’s good to separate them from the rest of your written content. After your first big photo and studio introduction, write a short paragraph or two about what a child’s experience will be in your studio. A combination of simple, engaging language and high-energy photos will help parents picture their child having a great time in your studio. 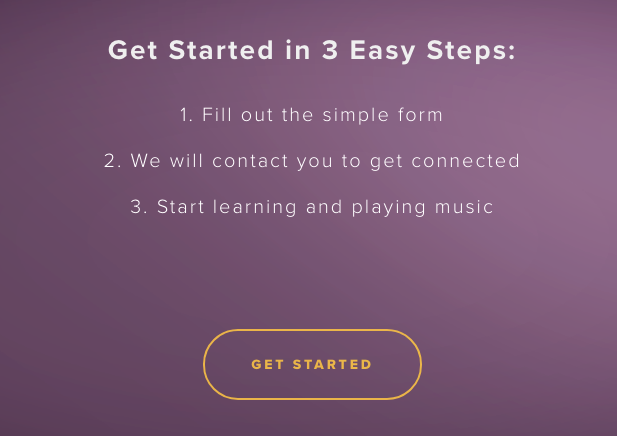 When a parent without music lesson experience arrives at your website, they don’t know what information they need. Parents will have no idea where to go, which will almost certainly cause them to leave in favor of of a less-confusing studio option. Don’t lose your parent audience! To make sure that parents know exactly where to go, start with your end goal. Do you ultimately want them to fill out a contact form? To enroll right there on your website? To join your studio email list? Once you decide on the destination, think about how to give parents key information while helping them to quickly reach that end goal. 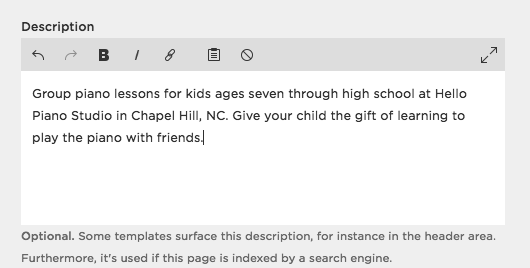 —> After giving parents a warm welcome on your homepage, you will want to lead them to a description of the lessons or classes that you offer (“Lessons” or “Programs” make this option clear). Parents can click on this page to learn about what you offer for their child’s age group. —> Now the parent probably has some questions (“Do I need a piano before starting lessons?”). An FAQ page is a great next stop to share answers to their questions. —> The parent now understands how lessons work in your studio and what they need to get started. They’re probably wondering about the teacher behind the lessons. After all, you are the adult who will be interacting with their child on a weekly basis. Begin establishing trust right away with a “Teacher” bio page. —> Finally, the destination. Label your contact or enrollment page clearly and make it easy to find. That’s a very clear path. Parents will easily be able to learn about your studio in just a few steps. Note: if you have a large studio or a number of programs, consider using a drop-down menu to organize your pages (like Roseville Piano Studio’s navigation, above). Use the same steps to keep it clean and logical. Bonus tip: If you have a logo in your navigation bar, you can link it to your homepage instead of listing “Home” as a separate page in your navigation. Don’t let parents get lost in paragraphs that give lengthy descriptions; engage their imagination with each sentence you write. Keep your language centered on their child’s experience rather than on your studio or philosophy. While parents may not yet be invested in your studio, they are deeply invested in their child’s experiences and growth as a person. If you want to keep parents invested in what you have to say, use your words to paint a picture of their child’s musical experience and personal growth in your studio. Bonus tip: Keep your paragraphs short; two to four sentences is optimal. If you find that your paragraphs run longer, look for natural places to break them into shorter blocks. Parents are very busy, and they face constant distractions. While reading about your studio, they may have a cranky toddler at their elbow and a third-grader whining about homework. Make it quick and easy for that parent to contact you before they leave their computer. It’s so easy to reach out to this studio! You’ll want to link each button to your contact page (or your enrollment form) and check to be certain they lead to the right place. Have you heard the term “SEO?” It stands for Search Engine Optimization. SEO matters to your studio. It’s how search engines like Google match your website with parents who are looking for music lessons. While the topic of SEO is huge and can be quite complicated, the good news is that it’s easy for you to do a few simple things to build strong SEO into your website. Include your location when you’re writing your website content. Next, use your location in the back end of your website. Meta tags: This is where you use a few words to describe the content of each page on your website. To add a meta tag in Squarespace (where we build our websites), go to your Pages menu and click on the gear icon next to a page name. A box will pop up on the right side of your screen with the page title, URL slug, and the meta tag field. If you’re using Wordpress, you can watch this brief video on adding meta tags. The meta description: This is where you use a sentence or two to describe your website, and is what people will see under your website name. You can find the meta description box under the SEO page or tab in your main website menu. This is super easy to find if you’re using Squarespace; choose “Settings” from the main menu, then choose “SEO.” If you’re using Wordpress,this article will help you locate it. What words would parents in your area use to search for the type of service you offer? Google is telling me that these are phrases related to my search. These are called “keywords,” or important search words. By including keywords in the content on your website, you can let search engines know that your website is relevant to what parents are looking for. See how I used nearly every possible keyword, some multiple times? It’s called keyword stuffing, and while it seems like you might win the SEO game by including every possible keyword, you will turn parents away immediately with content like this. Also, search engines are now able to recognize keyword stuffing and will penalize websites who use it. “Give your child the gift of confidence and self-expression through piano lessons. Your child will gain a wide range of musical skill while learning to listen, think independently, and find their creative voice. Our studio offers annual performance opportunities for students in venues from local coffee shops to UNC’s performing arts hall. Students quickly build confidence through this range of performance opportunities as they experience the joy of sharing their music with others. How many keywords can you find in those paragraphs? Is it valuable, relevant information? Do a quick search for lessons in your area. What keywords do you see at the bottom of the page that will improve your content, engage parents, and strengthen your SEO? Welcome to your tuned-up, powerful website. Congratulations! Your website looks so much better. When you arrive at your homepage, how do you feel now? How do you think parents will feel? Remember to share your shiny, updated website with your studio families and on social media. This is a great way to let people see your updated online image. It’s also helpful for your SEO, since search engines will see the increase in traffic on your website as a sign that it’s a relevant website to show to people. Bonus points! May your strong, newly-improved website launch you toward your studio goals.